Although Lynchburg, Virginia, was off the beaten path for most of the war, it certainly saw its fair share of action June 17-18, 1864 as part of the spring/summer Shenandoah Campaign. Jubal Early came to the rescue of his hometown, using the Second Corps of the Army of Northern Virginia to beat back a raid by David Hunter’s Federals. 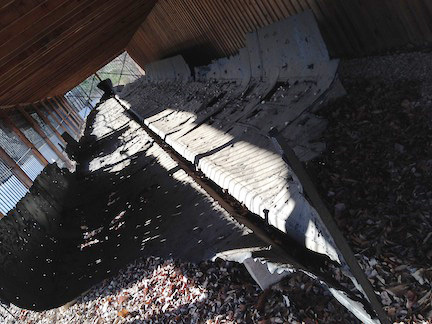 Today, the city hosts twelve Civil War Trails markers, including one of my favorite Stonewall Jackson-related artifacts, the remains of the packet boat The Marshall. The body arrived in Lynchburg on Wednesday, May 13, and a prayer service was held in the city. 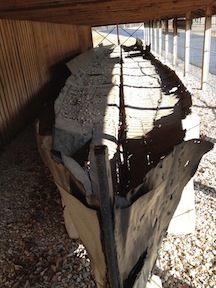 “The coffin was then placed aboard the Marshall, and mules connected to the vessel by towlines pulled it slowly upriver,” a Civil War Trails marker explains. The boat, which also bore Jackson’s widow, reached Lexington the following morning. 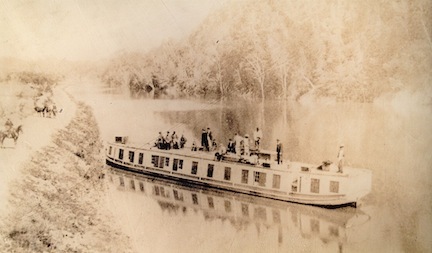 When David Hunter raided Lexington in June of 1864—on his way to Lynchburg—the Marshall sustained damage, although it was repaired the following year and continued in service until 1880 when the canal company went out of business and the old towpath became a railroad bed, the marker says. The cabin interior, paneled with Dominican mahogany, had staterooms for male and female passengers, and a dining salon in which were hung canvas sleeping berths at night. Aside from The Marshall, visitors can stop by the Civil War Chaplains Museum at Liberty University, Jubal Early’s gravesite at Spring Hill Cemetery, and any of the other Civil War Trail stops. Lynchburg was also the birthplace of the legendary Southern historian Douglas Southall Freeman. This entry was posted in Battlefields & Historic Places, ECW Weekender and tagged David Hunter, Douglas Southall Freeman, Jubal Early, Lynchburg, Stonewall Jackson, The Marshall. Bookmark the permalink.